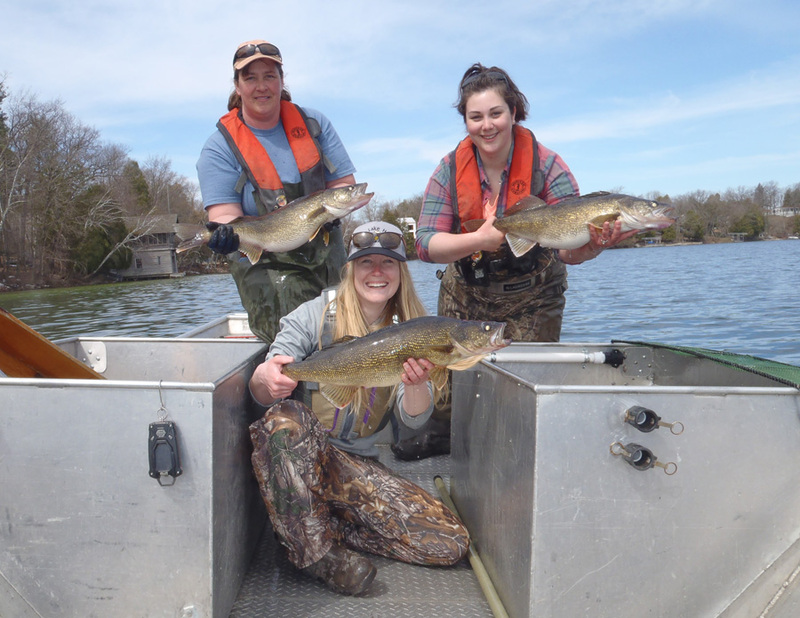 MADISON - More northern Wisconsin waters are opening up in time for the May 5 inland fishing season opener and walleye are likely to have finished spawning in many places and ready to put on the feedbag, state fisheries officials say. "It's been a long winter. Time to get outdoors and have some fun," says Justine Hasz, Wisconsin's fisheries director. "Fishing opening day is a great tradition, and the warmer weather last week and predicted for this week should set the stage for some good fishing. I'm hoping to catch some walleye and crappie this weekend." Much of the state is forecast to enjoy temperatures in the 70s this week, and that means that ice conditions can be highly variable and changing quickly, says Chief Warden Todd Schaller. Anglers planning to travel to northern Wisconsin to fish will want to check in with local bait shops or fishing clubs to get a read on local ice and fishing conditions. "No ice is safe ice, so anyone venturing out should use caution and know before you go," Schaller says. He also advises anglers to wear life jackets, fish with someone else, take a cell phone and tell someone your plan including where you are and when you'll return. While stocking of catchable size inland trout has occurred in southern inland waters, deliveries of fish to some northern inland waters will be delayed beyond the May 5 fishing opener at due to road weight limits and ice conditions. "Weather conditions haven't allowed us to stock all the fish we planned by the inland opener but we're working on it as fast as we can," says Dave Giehtbrock, fish culture leader. "We are waiting for road limits and ice to go off in the north." 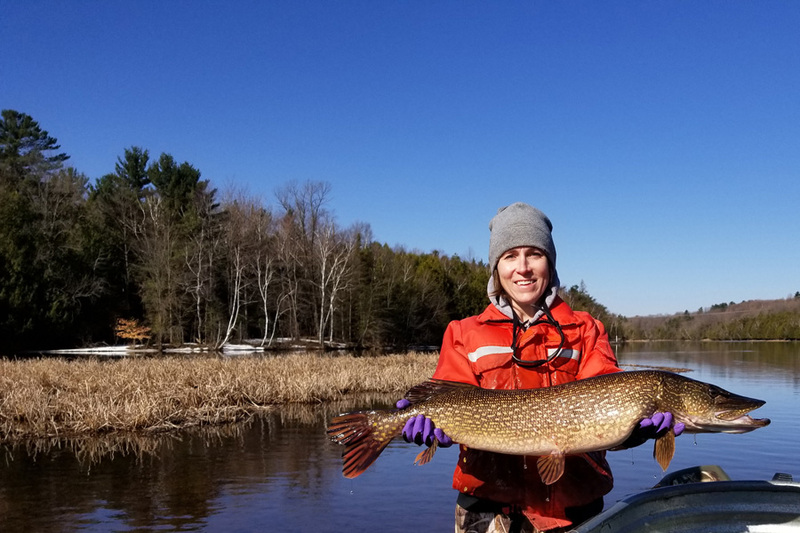 In all, about 740,000 catchable rainbow, brown, brook and lake trout will be stocked in more than 400 waters this spring. Anglers planning on targeting inland waters due for stocking can search the DNR website, dnr.wi.gov, for "catchable trout" to determine if fish have been delivered to their water. The ice fishing season is wrapping up as ice conditions deteriorate and Lake Superior is slowly opening up for boats. Currently access to open water is available from Port Wing to Cornucopia and from Saxon (Saxon will be closed for the season beginning May 15, 2018). 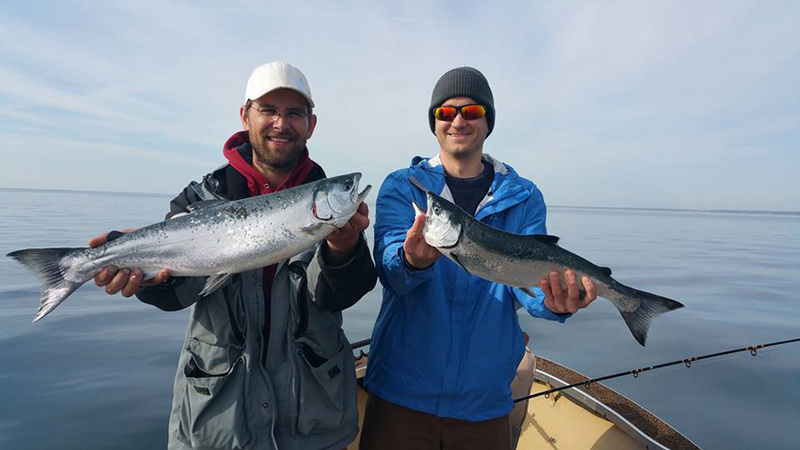 Anglers are reporting success in the near shore areas targeting Brown Trout and Coho. St. Louis River: The river is nearly ice-free throughout its length from Fond du Lac to Lake Superior. Walleye and northern pike fishing open on Saturday, May 12, and muskellunge and bass (largemouth, smallmouth) open on Saturday, May 26. All species carry minimum length limits and their populations contain plenty of "keeper" size fish. To fish the St. Louis River, you will need a fishing license from the state of your residence. For example, if you are a Wisconsin resident, you need a Wisconsin resident license; this allows you to fish both in Wisconsin and Minnesota waters of the river. Anglers fishing boundary waters are reminded to carry a paper copy of their fishing license. The walleye reigns supreme for the 2018 fishing opener in southeastern Wisconsin. Thanks to the stocking efforts of the Wisconsin Walleye Initiative, several strong year-classes of walleye have been established in many waterbodies in southeast Wisconsin. Along with stocking walleye, new fishing regulations will also be employed to protect these growing walleye populations from overharvest while providing catch-and-release opportunities for anglers. Beginning with the 2018 fishing opener, a county-wide 18-inch minimum length and daily bag limit of three fish will be in effect for walleye in waters in Kenosha, Racine, Sheboygan, Walworth, Washington, and Waukesha counties unless otherwise noted. This regulation is a management tool designed to encourage potential natural reproduction by protecting females from harvest prior to their first spawning, maximize yield of harvestable fish and provide quality walleye fishing for years to come. It's been a wild spring for weather but weather looks good for the weekend after the front moves through mid-week. 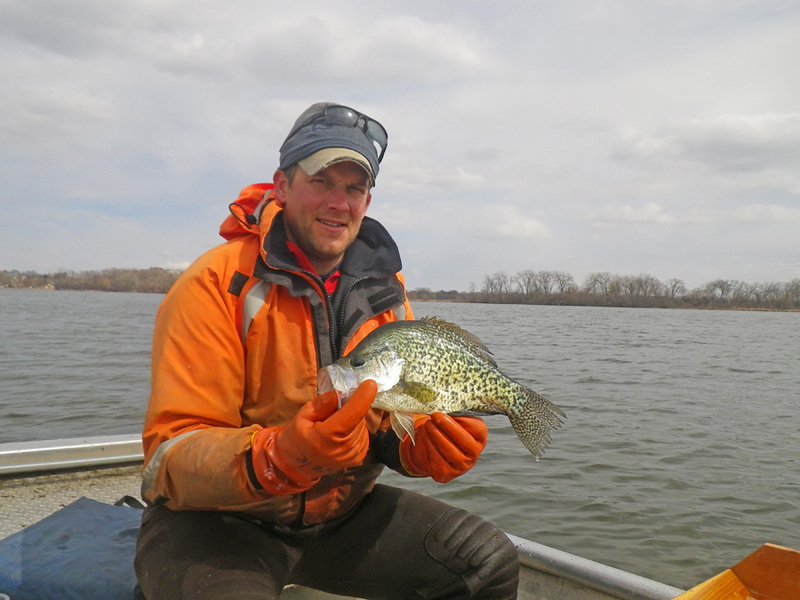 Fish populations look very good with walleye spawning finished on most lakes with Lake Mendota being the exception, where fish should be in shallow with water temperatures still in the low 40s. For the lakes that have warmed up to the mid-50s, expect fish to be in post-spawn patterns in flats adjacent to those spawning areas. The water on most lakes hasn't hit that clear water phase where daphnia become abundant and filter the phytoplankton from spring turnover, but it is right around the corner. Choose lures that account for the water clarity and in clear water choose natural colors and slower presentations. Walleye populations are looking great in southwestern Wisconsin and lakes are supporting two to six adult fish per acre with a strong year class from the 2014 plantings being 15-17 inches. Bass are beginning to move in and are holding in those pre-spawn locations and can be found near fresh aquatic plant growth. The same can be said for bluegills and crappies. Look for warmer water and new plant growth. This can concentrate those pre-spawn fish as they will feed on invertebrates and insects on the plants. Muskies may still be patrolling the shallows and looking for spawning habitat. They may be visible but not always interested in biting. Green Bay should be ice free by the opener and walleye angling should be very good. Area rivers and streams are fairly high now but if we don't get significant rain in the next two weeks then water levels will recede. Most of the Oconto, Peshtigo and Menominee river impoundments are ice free and offer a variety of angling opportunities. Manitowoc lakes are ice free and offer a mostly bass, pike, panfish fishery. Forest and Florence county lakes are iced in but anglers could enjoy trout fishing as long as the rivers and stream flows decrease before the opener. Good air quality for Wisconsin on Friday, April 19, 2019 at 6:03 pm CT.